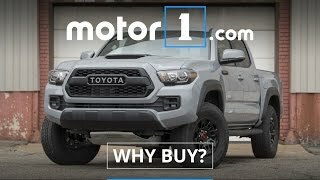 Toyota Tacoma TRD Pro 2017 is the most capable truck ever produced by Toyota. The brand debuted with TRD Pro series in 2014 with the versions like the Tundra, 4Runner, and Tacoma. 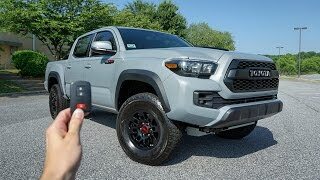 The Tacoma went to a change in 2016 and now it’s the 2017 version we are here with. It’s the superior off-road truck with enormous features. 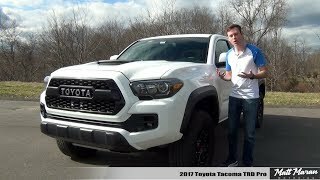 Let us have a close look at the reviews of the Toyota Tacoma TRD Pro 2017 and get to know more the hilarious truck introduced by Toyota. The interior of Toyota Tacoma TRD Pro 2017 is similar to 2016’s model, only some of the standardized changes are being brought to the model. The changes include weather floor mats, a TRD Pro shift knob, and the TRD Pro logo stitched on the headrests of the front seats. TRD Pro trim sits atop the Tacoma lineup, it comes standard with leather seats, rear parking assist sonar, Blind Spot Monitor, and Rear Cross-Traffic Alert. It also provides comfort with the 4-way adjustable driver’s seat with lumbar support and 4-way adjustable front passenger seat. There’s a TFT display that shows vehicle information, along with an integrated inclinometer and tilt gauge for off-roading. It also has an integrated GoPro camera mount on the windshield, just right of the rearview mirror. 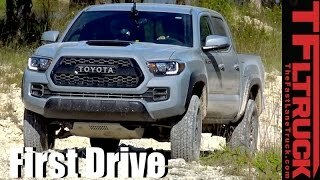 Toyota Tacoma TRD Pro 2017 has a tough exterior to perform off-road in the harshest conditions. It is enhanced with the 16-inch TRD black alloy wheels with Goodyear Wrangler and All-Terrain Kevlar-reinforced tires to provide maximum grip. 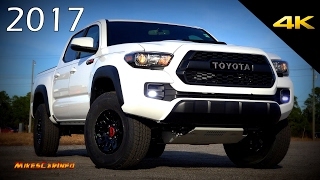 The front has a TRD Pro aluminum skid plate, LED fog lights, Projector-beam headlights with black bezels, LED Daytime Running Lights (DRL), and auto on/off feature. Rear is enhanced with Taillights with black bezels. There’s a TRD Pro badge on front door with diamond-pattern knurled finish, Black TRD Pro and 4x4 rear tailgate badging. Toyota Tacoma TRD Pro 2017 is having a most powerful engine option – the 3.5-liter V-6. It offers 278 horsepower at 6,000 rpm and 360 nm of torque at 4,600 rpm. There is a six-speed manual or six-speed automatic transmission. Power is then sent to an electronically controlled, two-speed transfer case that sends power rearward in 2WD and to all four wheels in 4WD. All this helps in attaining the top speed of 120km/h.